At roundabout by the Leisure Centre take second turnoff across the river Teviot into Mart Street and continue to the next roundabout Take the fourth turnoff into Bourtree Place and carry straight on passing the Horse Monument on your right into the High Street Just after the first pedestrian crossing lights turn left into O'Connell Street, and at the end of the Street Turn right at the T junction. and carry straight on, Border Auctions Sale Rooms are situated on the right hand side just after the car parks. At the roundabout take the first turnoff and follow the road round over the bridge into Commercial Road carry on until you come to the next roundabout take the third turnoff across the river Teviot into Mart Street and continue to the next roundabout Take the fourth turnoff into Bourtree Place and carry straight on passing the Horse Monument on your right into the High Street Just after the first pedestrian crossing lights turn left into O'Connell Street, and at the end of the Street Turn right at the T junction. 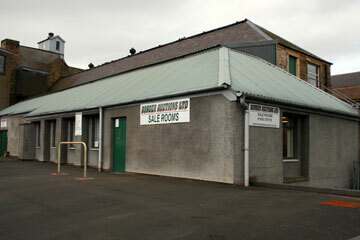 and carry straight on, Border Auctions Sale Rooms are situated on the right hand side just after the car parks. At the roundabout take second turnoff into Bourtree Place and carry straight on passing the Horse Monument on your right into the High Street Just after the first pedestrian crossing lights turn left into O'connell Street, and at the end of the Street Turn right at the T junction. 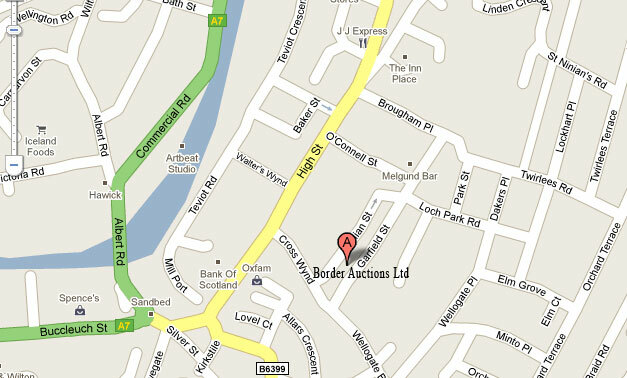 and carry straight on, Border Auctions Sale Rooms are situated on the right hand side just after the car parks. Hawick. Half way between Carlisle and Edinburgh the tourist route to Scotland. The scenic A7 crosses the River Teviot. 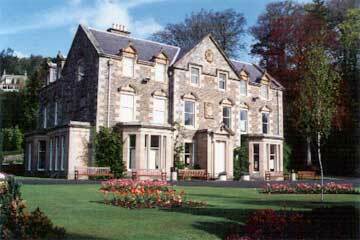 Here, historic and hospitable, is Hawick largest of our Scottish Border Towns. Capital of Cashmere and renowned for Rugby, Hawick offers its visitors a welcoming variety of experiences not least its spectacular Wilton Park with its unique museum, Restful Walled Gardens and mill shops with bargains galore! So take time to explore and to visit Tourist Information Centre at Tower Mill, Kirkstile, Hawick TD9 0AE (01450 373993) who can provide all the information you need to make the most of your time in this romantic of regions.